It looks like the New Xbox Experience will be going live tomorrow with its first... Wii Channel? Sure it may not have the grid-like precision of its Nintendo counter-part, or the obsessive content (yet), but the first thing I thought of when I laid my eyes on Capcom's "branded experience" for Super Street Fighter II Turbe HD Remix, was Nintendo's Wii Channels. The Super Street Fighter II Turbo HD Remix "destination experience" looks to be a hang-out spot, a "channel" if you will, for fans of the game on the Xbox 360.The "channel" will feature updates about new content, new trailers, and access to downloadable content. That includes the picture packs and themes you used to find running loose in the Marketplace on the Old Xbox Experience. 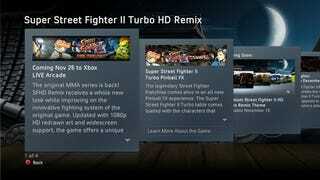 "With 1080p high-definition art and graphics, and the ultimate user feature set, Super Street Fighter II Turbo HD Remix is the perfect game to compliment the New Xbox Experience," said Christian Svensson, VP of Strategic Planning and Business Development at Capcom Entertainment Inc. "Capcom is dedicated to providing captivating content to the digital space and we're proud to participate in this new era of Xbox LIVE." What Capcom isn't totally clear on is exactly where this "channel" will show up in the New Xbox Experience. Hopefully it will be something you have to dig down to and not something that could clutter up the experience. I can't wait to see how else Msoft plans to monetize, and perhaps, clutter up their recently stream-lined interface.